Although Post Malone may be semi-new to the music scene, he showed us that he's a pro when it comes to performing for huge crowds. Austin Richard Post hit the scene in 2015 when he uploaded the infectious track “White Iverson” to his Soundcloud page—a banger that struck a cord with listeners around the globe. A few months later, he shared a video for the viral hit to YouTube, and from there, fans were hooked. Weeks later, he landed a deal with Republic Records, and Austin Post became the Post Malone. The Texas rapper released of his first-ever mixtape, August 26th, which included hits like "Monta" and "Never Understand". With features from , 2 Chainz, Jeremih, Jaden Smith, and even Lil Yachty, we've had the ten-song project on repeat since it came out back in May. We were able to catch Malone at the Ace of Spades music venue in Sacramento with openers Larry June, Jazz Cartier, and FKi 1st. He performed songs off his mixtape, as well as new ones from his upcoming album, Stoney, out December 9. 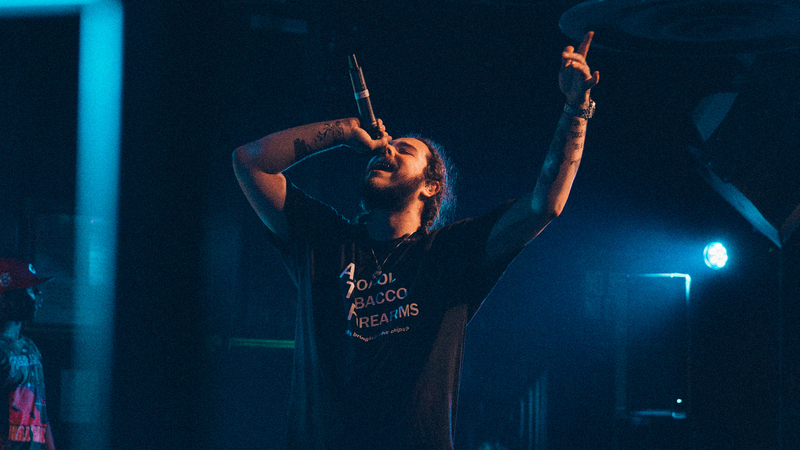 Check out these pics we snapped, and don’t forget to track Post Malone on Bandsintown so you can catch him in a city near you.